The energy from the turbine directs electrical charges in a generator into a “flow” of electricity. That’s a pretty simplistic overview, but it shows us that typical electricity generation largely relies on physical/mechanical action. A solar panel, on the other hand, largely relies on photonic action to create that flow. So, while there aren’t obviously moving parts with photovoltaic (PV) solar power creation, there is a lot going on when sunlight hits a solar panel. A photon is an elementary particle of light, and also a carrier of electrical energy. An electron is a particle in an atom with a negative elementary electrical charge. Silicon is a chemical element, and a key ingredient in solar cells. This material works so well because of its semi-conductor properties: it shares properties of both metals and electrical insulators. A solar cell is a device that turns sunlight directly into electricity through the photovoltaic effect (which we’ll explain below. While typically made from crystalline silicon, newer generations of solar cells use various chemical compounds, such as cadmium telluride, sandwich between panes of glass. This is called thin film technology. Solar cells are present in devices ranging from small chargers to larger arrays designed to power buildings, machines, and vehicles. A solar panel is a collection of solar cells arranged on a flat plane. How Does A Solar Panel Turn Sunlight Into Electricity? A pool table serves as a good metaphor for the type of chemical/physical action that takes place within a solar cell. The sun (or other light source) “shoots” a photon into the top layer of the cell. That layer has been infused with phosphorus to set electrons free from silicon atoms. Those photons strike the electrons, and knock them into another layer of silicon that’s been “doped” with boron. This chemical composition creates an absence of electrons: these are the pockets at which those electrons are aimed. The movement of particles between cells creates an electric field: the phosphorus layer becomes positively charged, and the boron layer becomes negatively charged. The electric insulating quality of the silicon helps maintain this field. The field provides order to all of this chaos, driving the particles into a moving current. This is the photovoltaic effect in action: essentially, sunlight uses its own particles to set electrons in motion. Keep in mind that this movement of particles requires an uninterrupted flow; any disruption of that flow shuts down the movement. What can cause such an interruption? Shade. 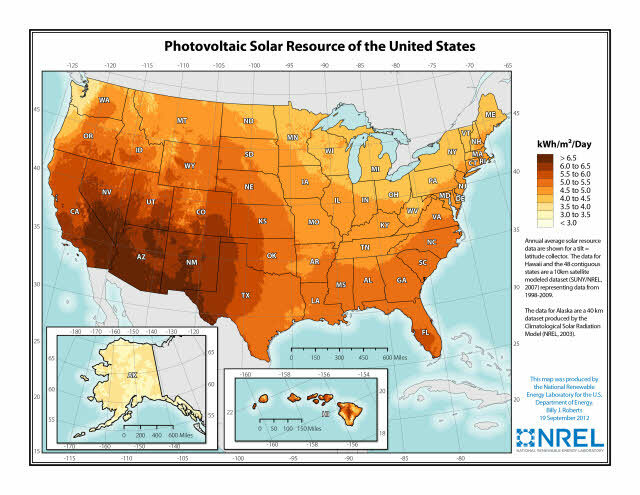 Your solar panel array must have completely unblocked sunlight available for it to work. At this point, electricity is present, but not in a form that’s useful to us. This electricity is in the form of direct current (or DC): it has fixed current and voltage. We need alternating current (AC) – oscillating current and voltage – to power the devices in our home, so the electricity is fed by a wire into an inverter, which makes the conversion. Now, We’re Good to Go, Right? Yes… but you may not need all the electricity being produced right now… and you definitely will need it when the sun’s not shining. You’re going to need to store that electricity for future use… but the way you do that depends on your relationship with your electric utility. 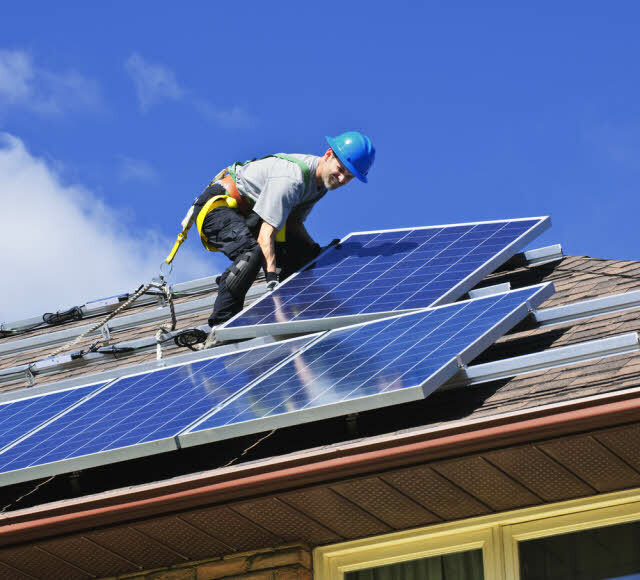 If your solar power system is connected to the electrical grid (which is most common), then the grid itself serves as your electrical storage. This means that you won’t be the only one using the power generated from your solar panels; rather, the grid will distribute that power as needed. If you live in a US state with net metering, your utility will generally have to pay you the retail rate for the electricity it buys from you. Your access to electricity will function just like any other utility customer (including outages when they occur). If you’re off of the electrical grid, you’ll need to set up storage capacity for the electricity you produce. That involves a bank of batteries connected to the solar power system. When you plug in, you’re actually plugging into the battery system, and drawing power from what’s been stored. Of course, if you drain the batteries, you’re out of power until the sun recharges them. A system that incorporates grid connection and battery back-up provides the best of both worlds: you don’t have to worry about running out of electricity, and you will have power available should the utility’s flow of electricity go down. Prepare to pay, though: these are the most expensive solar power systems. Will Solar Panels Generate All Of The Electricity I Need? Your weather and air quality: Cloud cover, rainfall, and snowfall will all affect the amount of electricity produced by your solar array. Smog and other air pollution will also diminish your system’s electrical output. The density of your air even makes a difference: a home set on a mountain will get better electricity production than one on the ocean because the air is thinner at higher altitudes. The orientation of your home and roof: Solar panels need to face either south or west; a number of factors come into play in determining the optimal orientation (including economic incentives). If you don’t have roof space facing the right direction, you may want to explore ground-mounted solar arrays (which can also incorporate trackers that keep the panels at the proper orientation based on time of day).